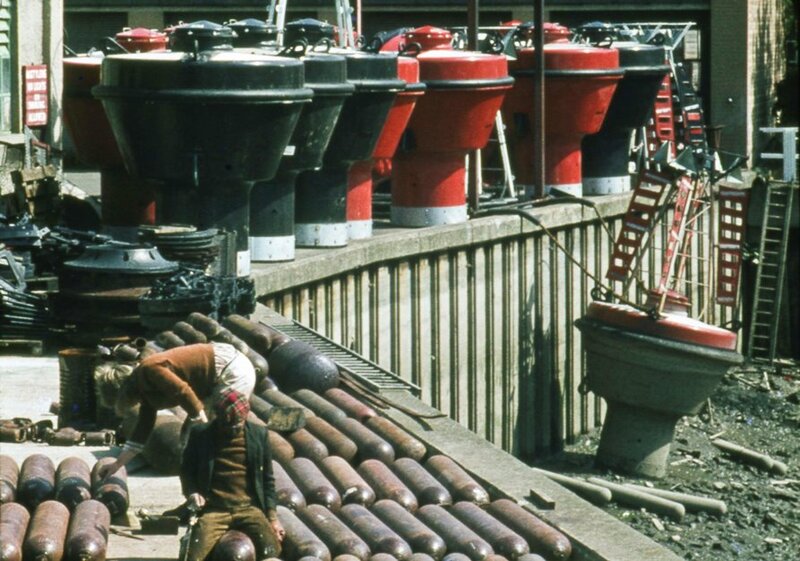 Peter Young took this photo on May 2nd 1973: 'One of the businesses that existed beside the river was AGA which made buoys for shipping lanes'. The photo shows the red and black buoys and gas cylinders. The following note is from an Ebay sale: 'In 1913 the Gas Accumulator Company (UK) Ltd (AGA) was established at Brentford in England and remained as company manufacturing site and offices for some 80 years. There were some name changes over this period and AGA was finally named AB Pharos Marine Ltd after the famous wonder of the world on the Isle of Pharos at Alexandria, Egypt. The photo includes two workers, one wearing a tartan cap (Bay City Rollers fan?). Please get in touch if you can identify them.